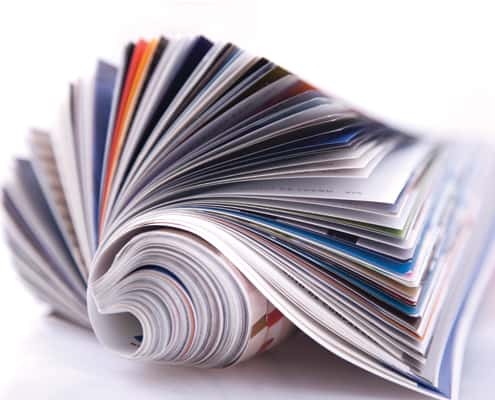 A magazine is a periodic publication aimed at the general public or catering to a specific niche audience. Irrespective of the intended audience, your magazine needs to entice and interest its audience such that they always keep coming back for more with the publication of each subsequent issue. Below are pointers to create an enticing magazine. Simply put, the masthead is the title of your magazine. Normally, it consists of a single word or two, initials, numbers, or a combination of these. The title of your magazine should capture the essence of the content within and should be memorable. As an integral part of your cover page, your masthead should speak for itself and should push your magazine in terms of sales or reach; hence, great care should be exercised as to the choice of the font type for your masthead. Why the reference to the title of your magazine as the masthead? Because it takes up the first quarter of your magazine’s cover page and when different magazines are stacked up on the newsstand with limited space, only the mastheads are visible as the newsstand maximises on the limited space; much the same way you would identify a book by its spine on the bookshelf of the local library. This is akin to a ship’s mast being the first visible part of the ship as seen by those at the seashore as it comes ashore. Though we are exhorted to never judge a book, or for that matter, a magazine, by its cover, it is human nature to accept or reject solely on first impressions. Which means that the cover page can make or break your magazine. As your magazine’s primary identifier, it should stand out, conform to your brand identity and adopt a house style that familiarises itself to its readership as pertains to each issue. As the saying goes, there is comfort in the familiar. Elements to strengthen and excite your cover page include deliberate and careful use of imagery, a familiar masthead in terms of choice and size of font, and an overall style that links each subsequent issue. That said, there is room for creativity when it comes to designing the cover page, though, the overall feel should not be too radical a departure from that which is familiar to the reader. While the layout is the skeleton of your magazine, serving to draw in readership right from the cover page, your content is the meat that nourishes your readers and converts them into loyal subscribers. The content should include featured articles as well as regular articles. The featured articles include one-off articles covering a particular subject, topic or personality, perhaps, with a main article and which is featured on the cover page. The regular articles serve as a continuity from this edition to the next and includes titbits, fictional stories, poetry and crossword puzzles. Your content should be well-researched, written and should conform to the rules of grammar and syntax. That aside, the content should be laid out attractively to lure the reader into delving into the content; of course, with appropriate imagery to give the eye a break between chunks of text. This calls for teamwork between the design department and the editorial department.